Students will create a creative abstract art project that helps build understanding of the connection of percents, decimals, and fractions with a denominator of 100. This practice includes review of converting decimals, percents, and fractions with a practice table that is "missing" information. Students will need to use the rules (plus some advanced thought) to convert between the different types of numbers to fill in the missing cells. A handy cheat sheet for students to use that shows the interconnectedness of decimals, percents and fractions. Helps students convert from one to the other. Converting decimals, percents, and fractions. 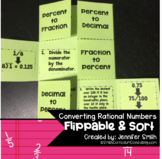 This is a foldable for converting decimals to percents, percents to fractions, and fractions to decimals. I will add an image later. Decimal Review : Read decimals as models, decimals, percents and fractions! Students complete a table of the colleges with the lowest acceptance rates. They are provided with either the percent, decimal, or fraction, and must fill out the two missing columns. Afterwards, students apply their knowledge of percents to answer several questions about the colleges. This chart gives either a percent, decimal, or fraction and the students have to fill in the missing 2 items. Great CAHSEE review. This quiz is perfect for a mid-chapter chapter two check in the McGraw Hill Mathematics book for sixth grade. It would also work as a review for Decimals, Percents, and Fractions. An Interactive notebook foldable. 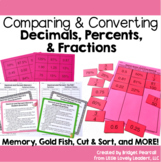 It is a how to guide to convert decimals, percents and fractions. there are two versions. 1 with space to create your own examples, and one with step by step examples. This is a reference sheet I cut and laminate for students! It give them quick access to the rules for converting between decimals, percents, and fractions. Have students fill in the arrows with brief instructions on how to convert values between decimal percent and fraction formats. This aid can be used for tutoring or to take notes. This jeopardy game covers everything from decimals and percents to expanded notation. It is played just like the gameshow. Students choose a category, choose a question and then answer the questions. They play in teams and must answer in the form of a question. This worksheet allows students to represent numbers as decimals, percents. and fractions. 25 TASK CARDS. 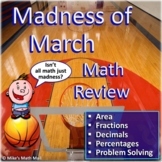 Students will convert between decimals, percents, and fractions.